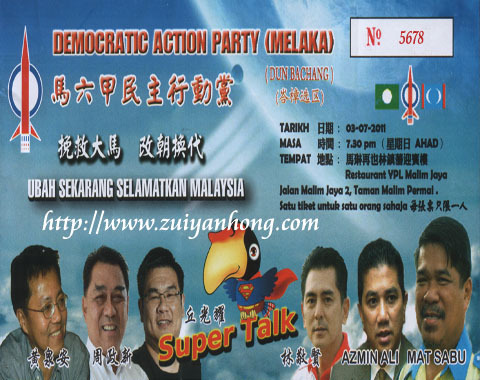 Malacca DAP Bachang Division will hold a dinner on July 3. The venue of the dinner is in Restaurant YPL, Malim Jaya. The speakers of the dinner are superstars of Pakatan Rakyat. They are PKR Deputy President Azmin Ali, PAS Deputy President Mohamad Sabu, DAP Superman Dr. Hew Kuan Yau, DAP Penang Jelutong MP Jeff Ooi, DAP Sarawak Kidurong State Assemblyman Chiew Chiu Sing and DAP Malacca Bachang State Assemblyman Lim Jak Wong. The response of DAP dinners are always overwhelming. Obviously, this reveals that Malaysian truly desire to change the political scenario.